Awesome. I was already excited about the delivery of fresh vegetables, so I couldn’t wait to give the recipe a try. Not long after Tesco bestowed me with my vegetable gifts, the postman arrived. A box! I think there are few things as exciting as a box through the mail. But what was in the box? Popcorn! 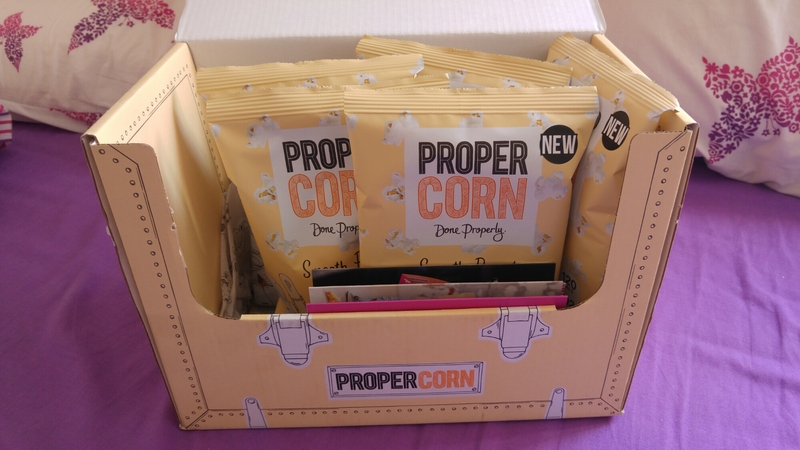 Or to be precise, Propercorn’s new flavour, Smooth Peanut and Almond. I had had Propercorn before, the Sundried Tomato and Worcester Sauce flavour being my favourite, but I had never had this one. Moving to the UK from Ireland, one of the strangest things I found here was being asked “Sweet or salty?” at the popcorn counter in the cinema. Sweet popcorn? What? Back home, you get salty or salty and that’s that. This was actually my first time ever trying a sweet flavoured popcorn. While my heart still lies with salty popcorn or the Sundried Tomato variety, it was tasty and easy to snack on. 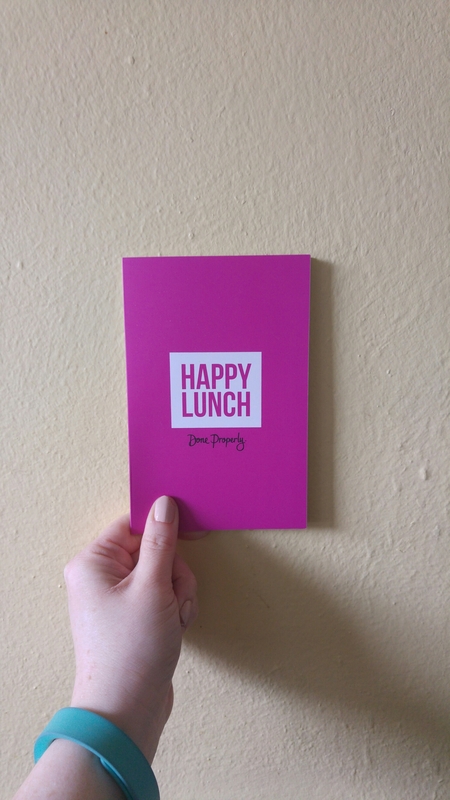 Also inside the box was this little recipe card. It told me a little about what I was about to make, and how to go about it. This was the recipe and ingredient list, and what I was to try and recreate! Colourful food is the best food in my opinion. It always looks so much healthier and fresher, and just feels like you’re doing good to your body. This was delicious, and probably one of the tastier meals that have come out of my kitchen. It did, however, take significantly longer than suggested on the recipe card. The recipe card said it would take about 10 minutes of prep and 45 minutes cooking. I think it took me a total of an hour and 40 minutes before I sat down to eat. There are a lot of ingredients, which is great as they’re all delicious… but using lots of ingredients means its a lot of potential waste, which is one of my pet peeves. There’s a lot more prep than expected, and it’s a little bit of a fussy dish to prepare. For something as simple as a salad, I’m not sure I’d be keen to spend so long preparing it. It also called for spiralised sweet potato. 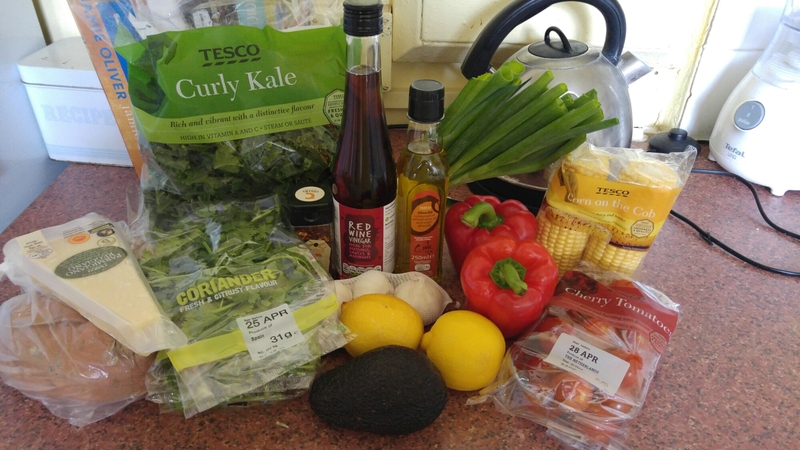 Unfortunately, I do not have a spiraliser, so I substituted with small chunks instead. I also left out the kale as I am not a fan of it. 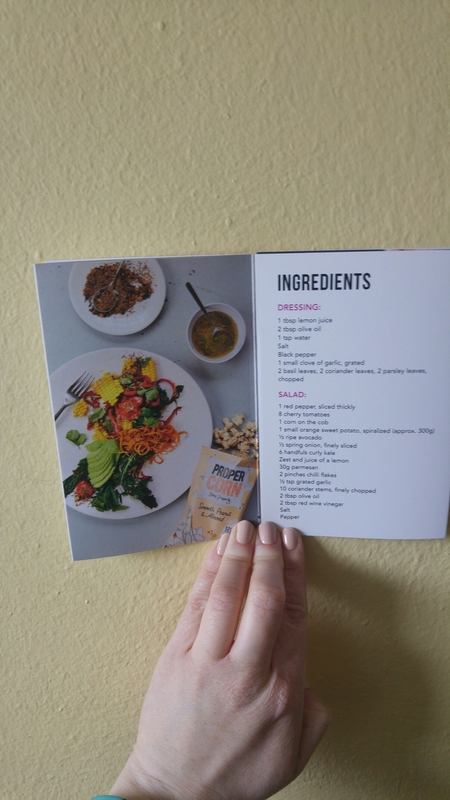 My favourite part of this dish was the dressing, and that’s definitely one part of the recipe I’ll happily make again. 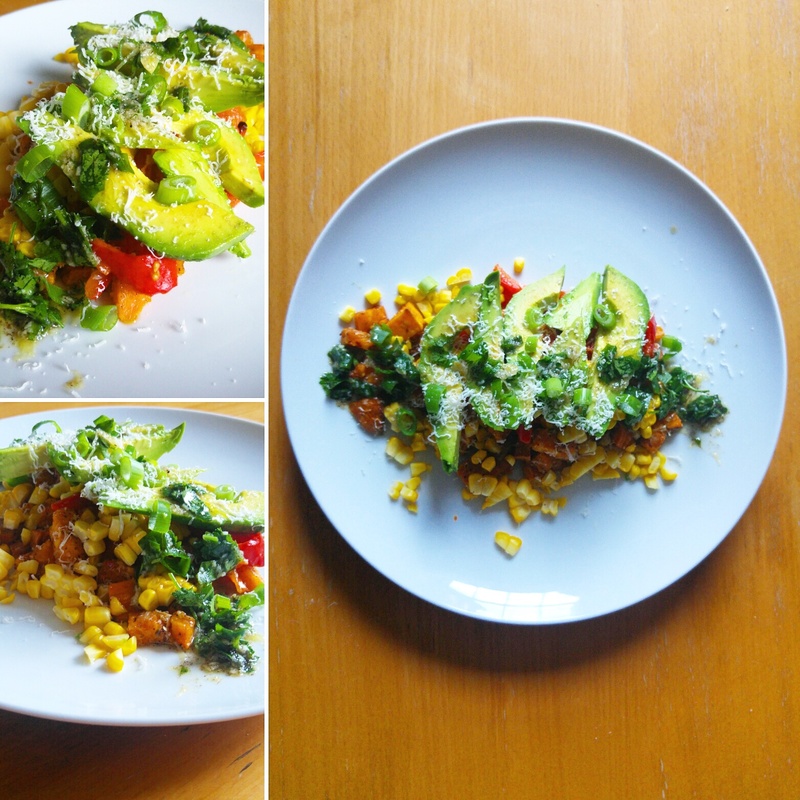 As for the rest of it, I think this is only something I’d recreate if I had veg to use up and someone to impress – I’m not sure I could justify the time and effort again for a simple lunch. All in all, it was yummy, and I spent a fun afternoon cooking. 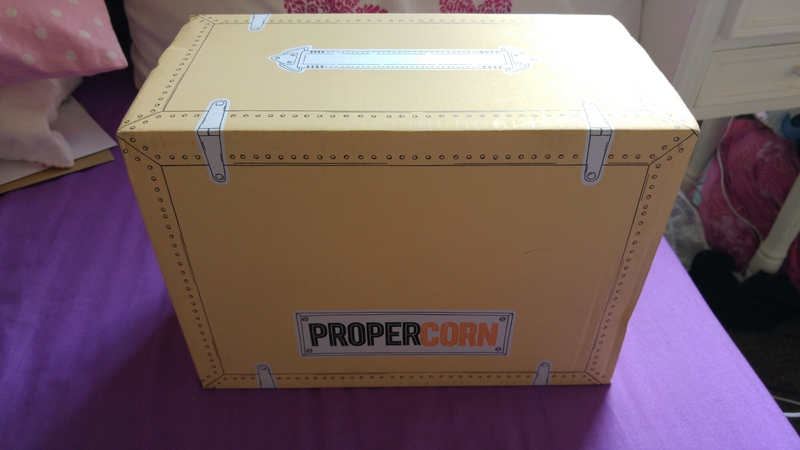 So thank you, Propercorn, for the meal! To make the dressing, combine all the ingredients in a small bowl and mix well. Turn up the oven to 200 degrees.